Sol Koved, former editor of First Days, died on August 23, 2017 in Lantana, Florida at the age of 95. He edited the journal for thirty years from 1960 to 1990, during which time it expanded significantly in frequency of publication and number of pages. He expanded First Days from six issues per year of thirty-two pages per issue to eight issues per year with about one hundred and forty-eight pages per issue. Sol also served as AFDCS executive director from 1986 to 1990. He received the Distinguished Service Award in 1975 and was awarded Honorary Life Membership 10 in 1985. In 1990 he was elected to the APS Writers Hall of Fame. His son, Lance, recalled in an article in the March/April 2017 First Days, attending AFDCS conventions in the late 1950s and early 1960s, adding that in those days family trips were based around the convention. He also said that his father continued to look forward to each issue of the journal. Lance also recalled that his father began a stamp collection that he expected would pay for his son’s college education. Although this did not work out, he still enjoyed the hobby. Sol also edited the United States Specialist for the Bureau Issues Association, now the United States Stamp Society, from 1978 to 1981. He served in the United States Army’s European Theatre during World War II. 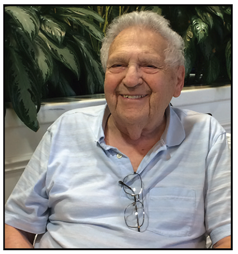 With a degree in chemistry from City College of New York he joined Montrose Chemical Company in 1943, where he held various positions including production chemist, pilot plant operator, and assistant plant manager. He left the firm in 1971. Sol took extension courses in industrial wastewater treatment, loss prevention control, industrial safety, pollution control, and toxicology. He worked in the environmental field and nuclear energy industry, and edited and published a six-volume emergency preparedness and response manual. After retiring, he and his wife, Harriette S. Koved, moved to Florida in 2002. She died on November 10, 2016, at the age of 90. Sol is survived by his brother, Fred, and sons Lance Koved and Alex Wisch, together with five grandchildren, and thirteen great grandchildren. A memorial service was held at Beth Israel Memorial Chapel in Boynton Beach, Florida, on August 27, followed by entombment at the Eternal Light memorial gardens in Boynton Beach. Memorial contributions may be made to the American First Day Cover Society or the American Heart Association. Peter McClure of Iowa Falls, Iowa is the 2017 recipient of the American First Day Cover Society’s Distinguished Service Award. Peter McClure is exactly what any organization wants in a volunteer. He doesn’t say why a job shouldn’t be done. He doesn’t tell you how the job should be done. He just does what is needed to be done. He doesn’t look for recognition beyond an occasional Bud Light. He just gets the job done. For the past five years, without recognition or acclaim, Peter has cacheted thousands of CEC/FM AFDCS cachets for the AFDCS Cachetmaker Series, producing new cachets for almost every US stamp issue. The sale of these covers has brought much needed revenue to the AFDCS, allowing the organization to maintain financial stability. Since 2013, he has produced the annual AFDCS Youth Scholarship first day cover. Peter has staffed AFDCS recruitment and sales tables at APS shows since 2008. He was the primary staffer for the AFDCS tables at AmeriStamp Expo 2015 and 2017. Peter does this at his own expense and seeks no recognition for his efforts. He has staffed the AFDCS table at multiple Americover shows and at cachetmaker bourses. He assists with the setup of the annual Americover Live Fund Raising Auction and is the runner for the auction. And he will help anywhere else he is needed. Peter started as a cachetmaker in the 1990s, producing first day covers first for his own use and then later (1999-2006) for sale on eBay. He cachet lines have included Cuv Evanson Cachets (frequently shortened to CEC), Sheky (for covers produced by his “evil twin”), and Bing (covers done in the style of Crosby cachets). The cachets he produces for the AFDCS Cachetmaker Series are labeled either CEC AFDCS or CEC/FM AFDCS. Peter collects Iowa related first covers, including Scott #838 (Iowa Territory), Scott #942 (Iowa Statehood Centennial), Scott #3088-3089 (Iowa Statehood Sesquicentennial), UX123 (Iowa Territory Sesquicentennial), and the 2002 Greetings from Iowa stamps. He is especially interested in first day covers of the 2010 Roy Rogers stamp (Scott #4444) and the 2014 Janis Joplin stamp (Scott #4916). In addition to first day cover collecting, he is an avid gardener. Charles J. O'Brien, III of Georgia received the Claude C. Ries Chapter Grand Award at Americover 2017 for his exhibit New York World's Fair 1939. This year marks the third time O’Brien has claimed the award since it has been sponsored by the Ries Chapter, and the seventh overall Grand he has received at Americover this century. His exhibit becomes eligible for the Champion of Champions competition at the 2018 APS Stampshow. The Reserve Grand and the Richard B. Thompson Award went to James S. Hering, M.D. for The Two Cent Hardings, Their First Day Usage And the Birth of Modern Cacheted First Day Covers. He also received the AFDCS Lawrence S. Fisher Award for Best Research Exhibit 1847-1931 and the United States Stamp Society Award. The Curtis B. Patterson Single Frame Grand Award and a Vermeil went to APS President Mick Zais for Hand-Crafted First Day Covers for the 1937 West Point 5-cent Commemorative. He also won the AFDCS Robert C. Graebner Award for Best FDC Exhibit by a First Time Exhibitor and AAPE Novice Award. A complete palmares is available here. Congratulations to all exhibitors! The AFDCS thanks the jury of Chief Judge Ken Nilsestuen, Mark Banchik, Chris Dahle, Tony Dewey and Tom Fortunato. At Americover, we have a cover for just about everything we do. A long-standing tradition is to give a souvenir cover to everyone who attends a ticketed event. This year, the covers for the Thursday tour and the Friday night President’s Banquet were designed by AFDCS board member and cachetmaker Tom Peluso. His cachet designs are pictured below. Other show events that will be commemorated with a limited-edition cover are the Saturday night “Moonlight Meal” after the cachetmakers bourse (cover by Dave Bennett), and the Sunday night post-show dinner at Melt Bar & Grilled. How do you obtain these covers? It’s easy--just attend the events! Tickets remain available for just a little while longer, so don’t delay. Order your tickets here. 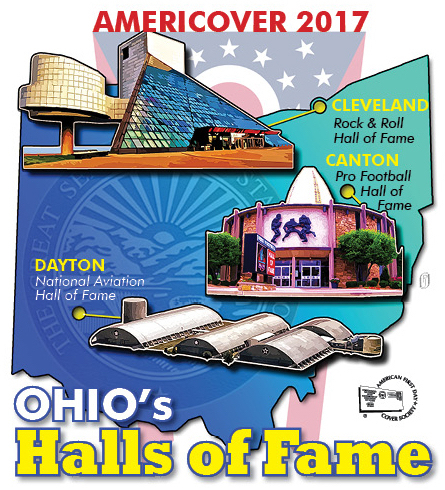 The theme of Americover 2017, to be held August 11, 12 and 13 in Independence, Ohio, is Ohio’s Halls of Fame. In conjunction with the show theme, the show cachet (above) and special postmarks will feature the Rock & Roll Hall of Fame, the Aviation Hall of Fame, and the Pro Football Hall of Fame. The postmark designs, shown below, will differ each day. Paul Johnson, who designed the AFDCS Court of Honor cover for 2014, created the cachet and all three postmarks. A set of three show covers AND an Azulillo stamped card FDC is $10 and will be available at the show. The Ries and Graebner Chapters are once again conducting the Hospitality Suite Silent Auction at Americover. This year's auction consists of 128 lots of covers, programs, and other philatelic material to pique the interest and bidding of our conventioneers. If you cannot attend Americover this year, but wish to bid upon one or more of the lots, you will need to get someone who is attending to "do your bidding" for you. As in past years, Foster Miller will accept "proxy" bids - either by email at fmillerfdc@gmail.com or via snail-mail to Foster Miller, Box 44, Annapolis Junction, MD 20701-0044. Email bids can be accepted until 9AM Saturday, August 10; U.S. Mail bids must be received by Monday, August 7. Winning proxy bidders will be asked to pay via credit card on the AFDCS website. Al Starkweather, editor of our journal First Days, reports that he has had a computer failure, resulting in a loss of all emails sent to him since December 2016. The failure also caused him to lose his emails contacts. Al asks that if you have submitted material for First Days in the last six months, please contact him to resubmit your articles and other information for publication. Al can be reached at editor@afdcs.org. 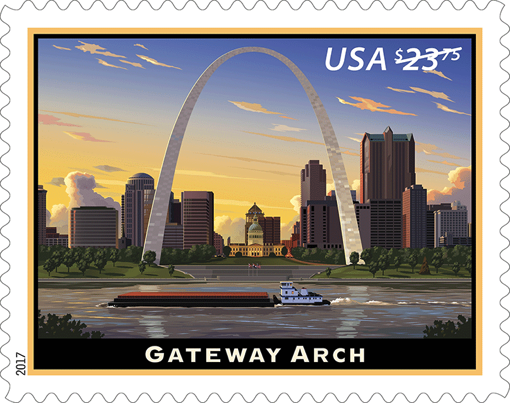 The American First Day Cover Society, the world's biggest non-profit organization of FDC collectors, has chosen Saint Louis for its 2019 show and convention. Americover 2019 will be held at the Renaissance St. Louis Airport Hotel July 26-28, 2019. The hotel’s address is 9801 Natural Bridge Road, St. Louis, MO, 63134. The AFDCS has already set Atlanta for Americover 2018, which will be held August 3-5, 2018. The official hotel rate for the 2019 stamp show will be $104, good from Wednesday through Sunday nights. Parking is free, as is a complimentary shuttle to and from the airport. All Americover guests will also receive free Wi-Fi in their rooms. Although Americovers run for three days, there will be a special tour on the preceding Thursday and a post-show dinner event Sunday evening. Americover was last held in Saint Louis in 1996. All Americovers are World Series of Philately shows dedicated to first day covers and the fun of stamp collecting. Locations move around the country: 2017's show will be held in the Cleveland area and 2016’s show was held in Falls Church, Va., near Washington, D.C. Other recent shows have been held in Somerset, N.J., Oak Brook, Ill., Irvine, Calif., and Indianapolis, Ind. The American First Day Cover Society, the world's biggest non-profit organization of FDC collectors, has chosen Atlanta, Georgia, for its 2018 show and convention. Americover 2018 will be held at the Hilton Atlanta Northeast August 3-5, 2018. 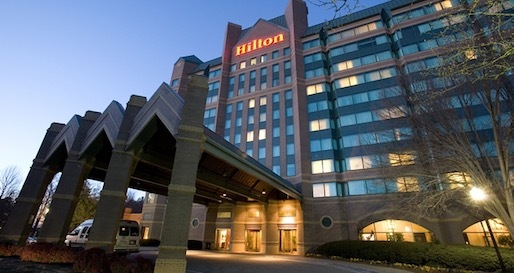 The hotel’s address is Hilton Atlanta Northeast, 5993 Peachtree Industrial Boulevard, Peachtree Corners, GA 30092. The official hotel rate for the stamp show will be $99, good from Wednesday through Sunday nights. Parking is free, as are the hotel's breakfast buffet (for up to two guests per room per morning) and a complimentary shuttle to nearby areas. This is the same venue used each January by Southeastern Stamp Expo. 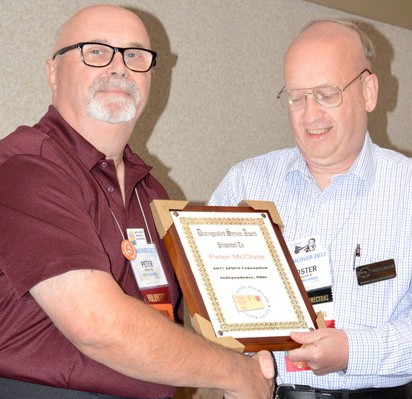 "Many of you have attended our yearly AFDCS Regional Meetings at the Expo and know what a great facility this location offers," said Southeast Federation of Stamp Clubs president Charles O’Brien, III, a gold-medal winning first day cover exhibitor. "Please join us for a great time, some fun with friends and first day covers and our Southern hospitality." Ken Nilsestuen (left) is Chief Judge of the Americover jury. He is treasurer of the American Philatelic Research Library and the Institute for Analytical Philately, and president of the France and Colonies Philatelic Society. His main focus is Algerian postal history. He also collects and exhibits the 1949 Minnesota Territorial Centennial issue and its first day covers. Mark Banchik is an international (FIP) judge and current president of the Collectors Club of New York. He is past president of the American Philatelic Congress, the Mexico Elmhurst Philatelic Society International (MEPSI), and the American Air Mail Society. He exhibits Mexican military postal history. Chris Dahle is vice president and webmaster of the Scandinavian Collectors Club. He has served as secretary/treasurer and associate editor of the Biology Unit of the American Topical Association, and is treasurer of the United Nations Philatelists. Chris has been secretary of the Cedar Rapids (Iowa) Stamp Club for many years. 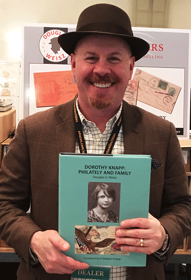 Tony Dewey is past president of the United Nations Philatelists and is active with the American Association of Philatelic Exhibitors where he has promoted exhibiting and coordinated the team competitions at AmeriStamp Expo. He has exhibits about the International Education Bureau and its service to prisoners of war, United Nations issues, and four different first day cover exhibits among others. Tom Fortunato is past president of the Rochester (NY) Philatelic Association and has chaired and been the driving force for the annual ROPEX show. He is past chairman of the APS Chapter Activities Committee and managed the marketing and public relations for both Washington 2006 and World Stamp Show New York 2016—a role which he will reprise for Boston 2026. Tom’s collecting and exhibiting focuses on thematics and modern philately. 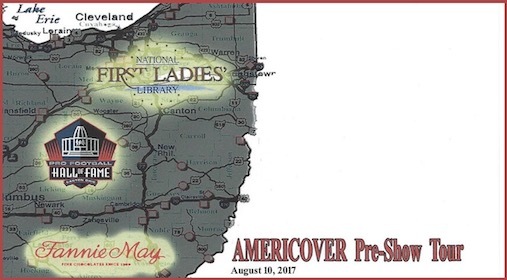 The American First Day Cover Society's pre-Americover 2017 tour will include visits down the Hall of Fame Corridor (Interstate 77) to the First Ladies National Historic Site and the Pro Football Hall of Fame, as well as a stop at Harry London’s Chocolate Factory. Americover 2017 will be held August 11-13 at the Embassy Suites Cleveland-Rockside in Independence, Ohio, just outside Cleveland — just down Interstate 77 from the city, in fact. The tour bus will depart from the hotel Thursday morning, August 10. Tickets include transportation and all admission fees. Participants will be able to purchase lunch at the Pro Football Hall of Fame's Tailgating snack bar. The price for the tour is $58 if purchased on or before June 30, and $63 after that date, if space is still available. Tickets may be purchased online or by mail, using the order form in the March-April issue of First Days, the official journal of the AFDCS. Non-members are welcome on the tour and can use the website or request a copy of the Americover 2017 event order form by sending a self-addressed stamped envelope to the AFDCS, PO Box 44, Annapolis Jct., MD 20701-0044. 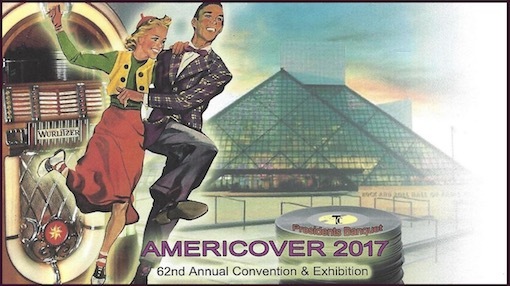 Americover 2017 is the AFDCS' annual show, convention and celebration of first day cover collection. Each year, it is held in a different part of the country. In 2016, it was in the Washington, D.C. area; in 2018, it will be in Atlanta. 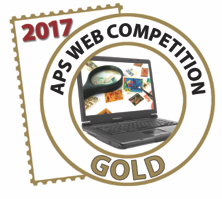 Americover is part of the American Philatelic Society's World Series of Philately, and the winners of its competitive exhibitions are automatically entered in the annual Champion of Champions competitions. There is also a Sunday evening event involving dinner; this year, it will be in a private room at Melt Bar & Grilled, famous for its grilled cheese sandwiches and craft beers. There is a special Americover room rate of $102 at the Embassy Suites Cleveland-Rockside, which includes Wednesday and Sunday nights. There also will be two bourses (commercial dealers and cachetmakers) at the show, a banquet, meetings, a youth table, a hospitality suite, live and silent auctions, seminars, a first day ceremony for the U.S. Postal Service's Azulillo stamped card, and a forum by a postal official involved with first day covers. 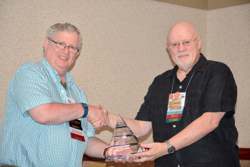 Nominations will be accepted through May 1 for the Philip H. Ward Award for Excellence in First Day Cover Literature, presented annually by the American First Day Cover Society. All works published in 2016 are eligible. All articles published in First Days, the AFDCS journal, are automatically considered. Others may be submitted to the Ward Award Committee chair, Mark Goodson, 202 W. Temperance Street, Ellettsville, IN 47429, bgdsn@comcast.net. McMaster received the first runner-up prize for “The 1898 One-Cent Green Franklin, Scott 279; The Issue Date and EDUs,” which appeared in the March-April 2015 issue of First Days, the official journal of the AFDCS. Warren, a charter member of the AFDCS, wrote a five-part series in First Days, “Denmark Birth Certificates: Commemorative First Day Covers,” which concluded in the September-October 2015 issue. The awards are presented each year at Americover, the annual show and convention of the AFDCS. Americover 2017 will be held August 11-17 in Independence, Ohio. The award is named in honor of Philip H. Ward (1890-1963), the distinguished Philadelphia stamp collector, dealer and journalist who was a pioneer in the field of first day covers. The award was instituted by the AFDCS in 1964. 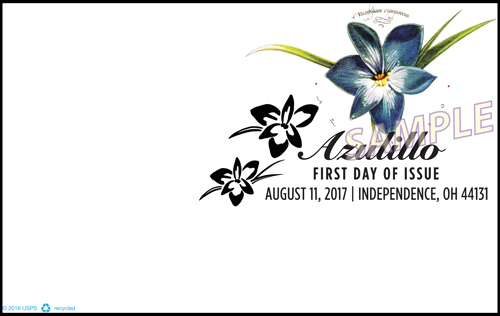 The American First Day Cover Society plans to hold a first-day ceremony at its Americover 2017 show and convention for the Azulillo stamped card, which will be issued on the opening day of the show in the same city, Independence, Ohio. Americover 2017 will be held August 11-13 at the Embassy Suites by Hilton Cleveland-Rockside in the Cleveland suburb. Americover is the annual World Series of Philately show dedicated to first day covers and the fun of stamp collecting. It is held in a different location each year. The American First Day Cover Society is the world's biggest non-profit organization of FDC collectors. "Azulillo" is one of the common names for the Chilean blue crocus (Tecophilaea cyanocrocus). Loosely translated from Spanish, "azulillo" means “little blue thing.” Native to Chile, it was believed to be extinct in the wild until its rediscovery in 2001. Although it resembles one, it is not actually a crocus. This flower does best in frost-free mild climates, and is most likely to be found in the Independence, Ohio, area in greenhouses. The official hotel rate for the stamp show will be $102, good from Wednesday through Sunday nights. Parking is free, as is a cooked-to-order breakfast, evening reception, and in-room Wi-Fi service. There is also a complimentary shuttle to the airport and to other attractions within three miles of the hotel. The American First Day Cover Society is seeking exhibits for Americover 2017, a World Series of Philately show to be held Aug. 11-13 in Independence, Ohio. Ken Nilsestuen will head the jury. The prospectus is now available on the AFDCS Web site by clicking this link, by regular mail from Kerry Heffner, 17656 K Street, Omaha, NE 68135-3491, or e-mail at exhibits@afdcs.org. The deadline for entering the Americover 2017 exhibition is June 1, 2017, or whenever the available frames fill up, as happened last year. As a WSP show, the winner of the Grand Award at Americover 2017 will be part of the Champion of Champions competition at Stampshow 2018. Ronald J. Klimley, winner of the 2016 Grand with "The 1964 New York World’s Fair Commemorative," will represent Americover this summer in Richmond, Virginia. In addition, if six or more competitive single-frame exhibits are entered, the Curtis B. Patterson Award recipient for the best single-frame exhibit will be invited to enter the APS Single-Frame Champion of Champions competition at AmeriStamp Expo in 2018. 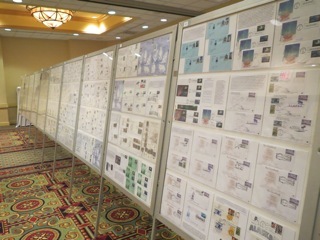 The three-day World Series of Philately show will be held at the Embassy Suites Cleveland-Rockside, and there is a special Americover room rate of $102. There also will be two bourses (commercial dealers and cachetmakers), a banquet, meetings, a youth table, a hospitality suite, a live auction a silent auction, seminars, a pre-show tour of the area, and a post-show evening dinner event. A first day ceremony is being sought.